The industrial supply company, along with rivals Fastenal and W.W. Grainger, has struggled with weakening growth in 2015. Here's what to look out for in its first set of results in 2016. It's no secret that growth in the industrial sector has slowed in the last year, and manufacturing has borne the brunt of it. Worse yet, MSC Industrial Direct Co.'s (NYSE:MSM) competitors, Fastenal (NASDAQ:FAST) and W.W. Grainger, Inc. (NYSE:GWW), have already reported weak sales numbers in December. It's going to be a difficult quarter for the industrial supply companies. That said, investors will want to keep a keen eye out for MSC Industrial's first-quarter results and commentary on Jan. 6 and hope for signs of future improvement. Here are three things to look for. Since then, conditions have deteriorated, and the November sales figures from Grainger and Fastenal weren't encouraging, either. Fastenal reported a 1.1% decline in daily sales compared to November 2014. Moreover, it experienced a 1.6% decline in manufacturing daily sales, with even nonresidential construction daily sales declining 5.1%, a point I will come back to later. It's a similar story with Grainger. On an adjusted basis (non-recurring Ebola-related and seasonal products), Grainger's U.S. sales declined 2% in November compared to the same period last year. Organic sales are a better way to judge growth, but even here, its organic sales (excluding foreign exchange and acquisitions) declined 3% in November. Don't expect too much from MSC Industrial. With that said, the company's guidance will be important. The market knows the industrial sector is slowing, and investors will be looking for any signs of recovery -- and when it happens, the industrial supply companies usually hear about it first. On a stock-specific note, MSC Industrial is undergoing an expansion strategy whereby infrastructural investments have been made to increase stores and head count (75% more field associates in the fourth quarter compared to the same period in 2013) while going for growth with national accounts. All these activities tend to be dilutive to operating margin. 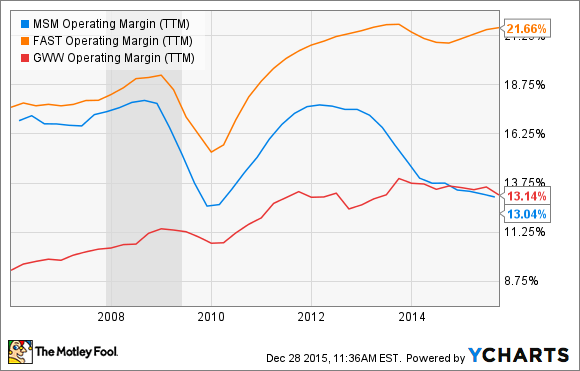 Indeed, as you can see in the following chart, MSC Industrial's margin was falling before the industrial slowdown in 2015, and particularly relative to its competitors. First, average transaction-size growth was in positive territory throughout 2015. In the last two years, the company's average transaction has increased 1.6% from the fourth quarter to the first. If the same thing happens this year, then average transaction size could be around $420 compared to the fourth quarter's $414. DATA SOURCE: MSC INDUSTRIAL DIRECT CO. INC. PRESENTATIONS. YEAR-OVER-YEAR COMPARISON. Second, total e-commerce sales fell on a sequential basis in the fourth quarter, and considering its importance as a growth platform, investors will want to see an improvement in the first quarter. Third, as you can see below, the company's manufacturing (around 70% of total revenue) sales growth has slowed, but so has its non-manufacturing. Considering Fastenal's disappointing November sales growth figures for nonresidential construction sales (see above), MSC Industrial's non-manufacturing sales could come under pressure. DATA SOURCE: MSC INDUSTRIAL DIRECT CO. INC. PRESENTATIONS. All told, in terms of the broader market, the company's guidance is probably more important than its sales figures in the coming report. In truth, industrial supply companies tend to have short sales cycles so their forward visibility is limited, but any sign of improvement through the quarter would be warmly received. On a stock basis, MSC Industrial followers will want to keep a close eye on the operational metrics outlined in the third section in order to monitor developing trends in the business.